Smocks and Sprinkles: Fun & Educational Plastic Easter Egg Activities! Well Easter has come and gone and we are left with a gazillion plastic eggs...I have stepped on far too many these past few days. 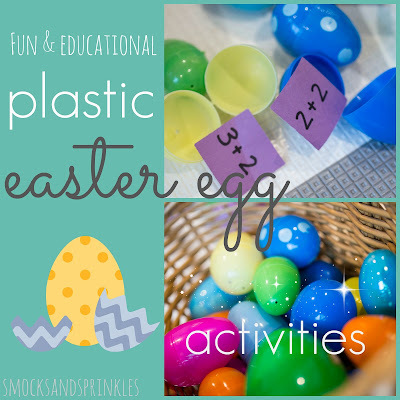 As annoying as these plastic eggs may be, they're also pretty fantastic when it comes to creative educational activities for kids. Seriously, there are a ton of different activities you can do with them! Since it was a pretty yucky rainy day today and we were stuck indoors, my daughter and I came up with a fun simple game that she couldn't get enough of! 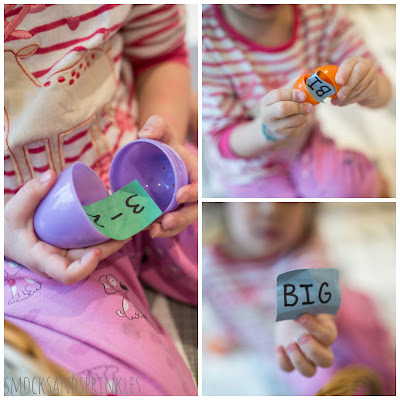 She loved the element of surprise involved in opening up the eggs to reveal the questions. 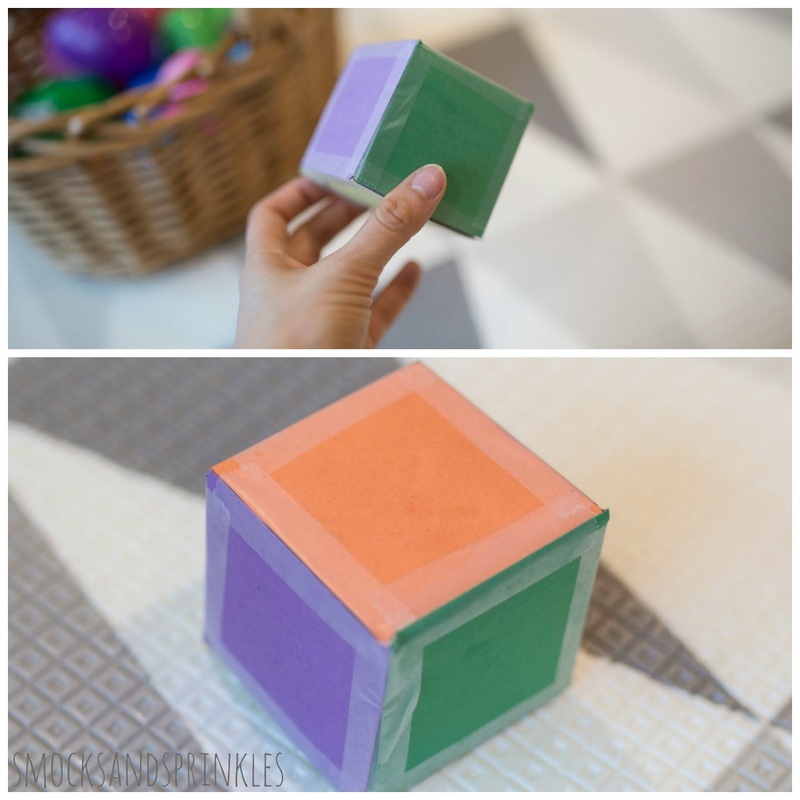 To make the dice, simply cut colored paper to size and tape onto each side of the cube. Make sure each side is a different color (to match the plastic eggs). Come up with a different question to put it in each plastic egg. 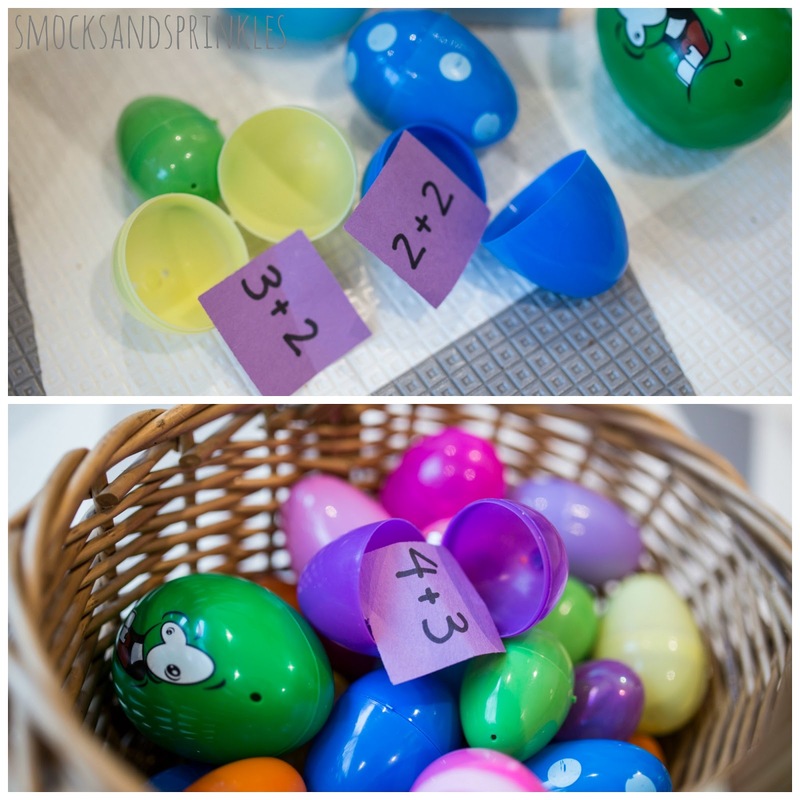 We decided to fill the eggs with simple math questions and easy reading words. Write each question out on a small piece of paper and stuff them in the eggs. 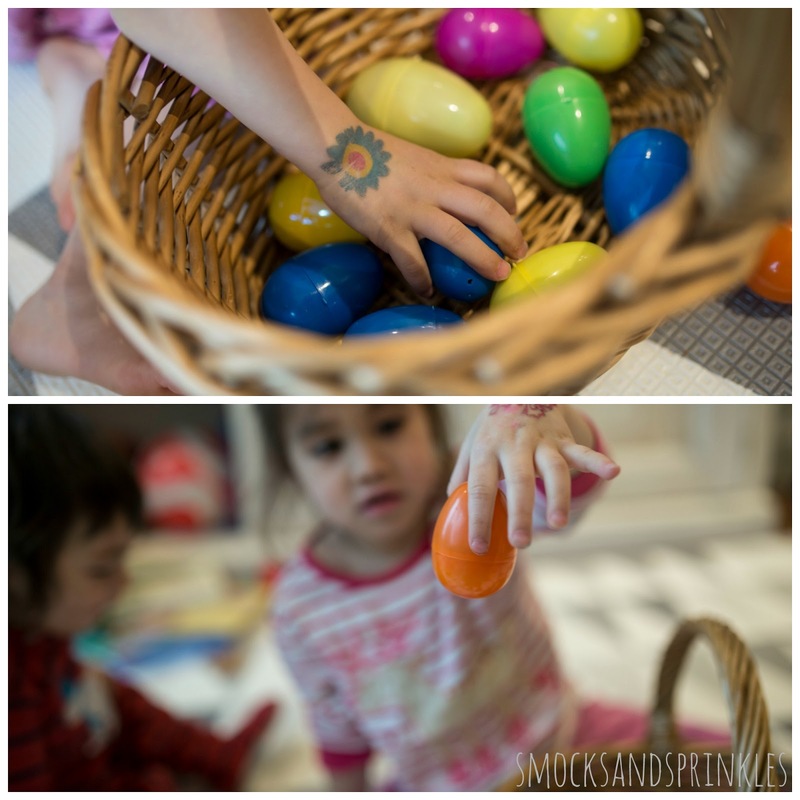 You can really fill the eggs up with anything that you are trying to teach your child. Our next game will be sight words! Fill a basket or container with all the question-filled eggs. 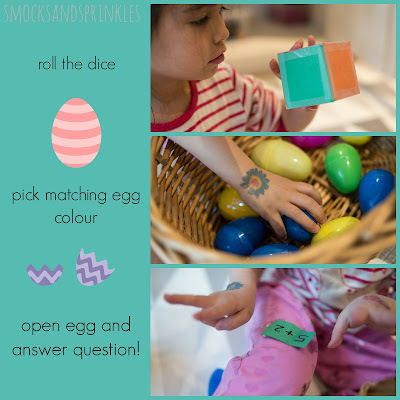 To play the game, first player rolls the dice and selects an egg that matches the color that was rolled (also a great way to teach colors to younger children!). They answer the question. If they answer the question correctly, they get to keep the egg. If not, the question and egg is put back into the basket. She was so excited when it was her turn to open the eggs to reveal the questions! The second player goes next and so forth until all the eggs are gone from the basket. How great is this game for practicing turn-taking! The player with the most eggs in the end wins! In our game, we played non-competitively and we helped each other answer the questions. I pretended not to know the answer to many of the questions to have my daughter teach me how to get the answer. Alphabet stacking - write the letters on the eggs, stack them in order as you sing the alphabet song, knock down the tower at the end! You could also make holes in the eggs and string them in order onto pipe cleaners or string to create a cute caterpillar (you can also do this with numbers). 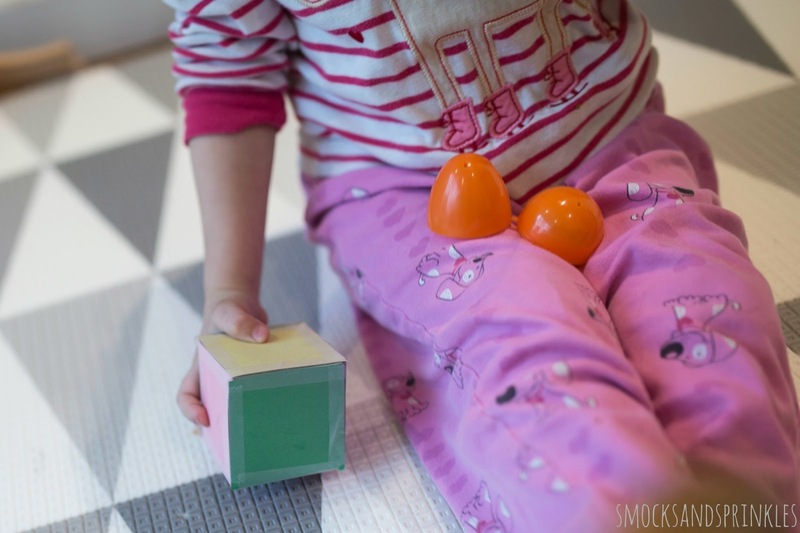 Spelling - fill each egg with Scrabble or letter tiles (or foam letters) to spell a word, open the egg and have the kids rearrange the letters to spell a word (to make it easier, write out the word on the outside of the egg so they have a guide to follow as they spell). Make it a scavenger hunt for even more fun! Shakers/maracas - fill the eggs with rice & beans and shake away (decorate the outside for more fancy fun...maybe even with a little paper mache fun for the brave among us). Create a handle using 2 plastic spoons! Grow crystals inside your plastic eggs - coat the eggs with a layer of glue, sprinkle on alum and allow it to dry. Then soak it in an alum solution for 12 hours to grow gorgeous crystal geodes! 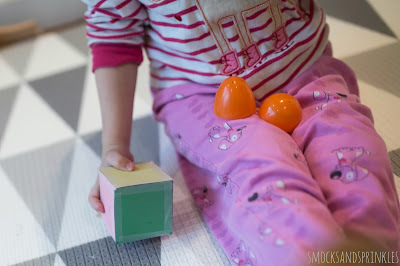 Easter egg snack or lunch - Use eggs to store different snack foods and put all the eggs in a carton to serve, kind of like we did with an ice cube tray! 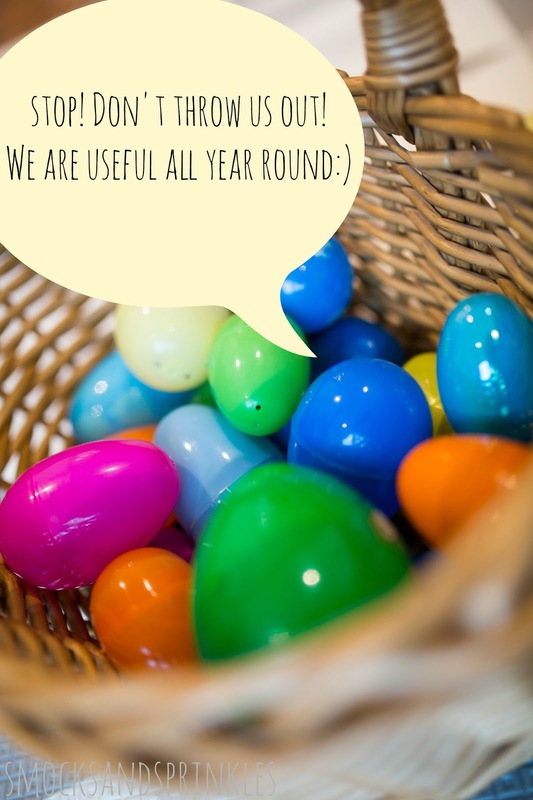 Please let us know if you think of any other fun plastic egg activities! And don't forget to tag us on instagram (@smocksandsprinkles).